Jan 2019: Shi Lab welcomes new MS student Makua Vin-Nnajiofor (joined spring 2019) and new PhD student Can Liu (joined fall 2018). Oct 2018: Shi Lab welcomes Kristian Bolden and Jonathan Lott, both high school seniors from Carter G. Woodson Academy, Lexington. Kristian and Jonathan will work on antioxidant fermentation from cellulosic biomass and explore its application to extend produce shelf-life. The team will then compare application of biomass derived antioxidant with a customized pulsed Ultraviolet (UV) system to treat fruits and vegetables, a device previously built in Dr. Bode's Lab. Sept 2018: Abby Olaleye received a KY NSF EPSCoR Research Scholars Program (RSP) Award to investigate new ways to produce crop yield enhancer/bio-fertilizer from food wastes. The award also supports her travel to a professional conference. June 2018: Shi Lab welcomes UG summer interns: Alex Espinosa, Truc Nguyen, Abby Olaleye, and Jameson Hunter. April 2018: Members from Shi Lab presented talks and posters at the 40th Symposium on Biotechnology for Fuels and Chemicals at Clearwater, FL. March 2018: Makua Vin-Nnajiofor and Luke Dodge presented posters at the 255th ACS National Meeting & Exposition, New Orleans, LA. March 2018: Members from Shi Lab attended the 2018 KY-LSU EPSCoR Track II 2nd Annual Joint Conference and toured LSU/Ag center at Barton Rouge, LA. 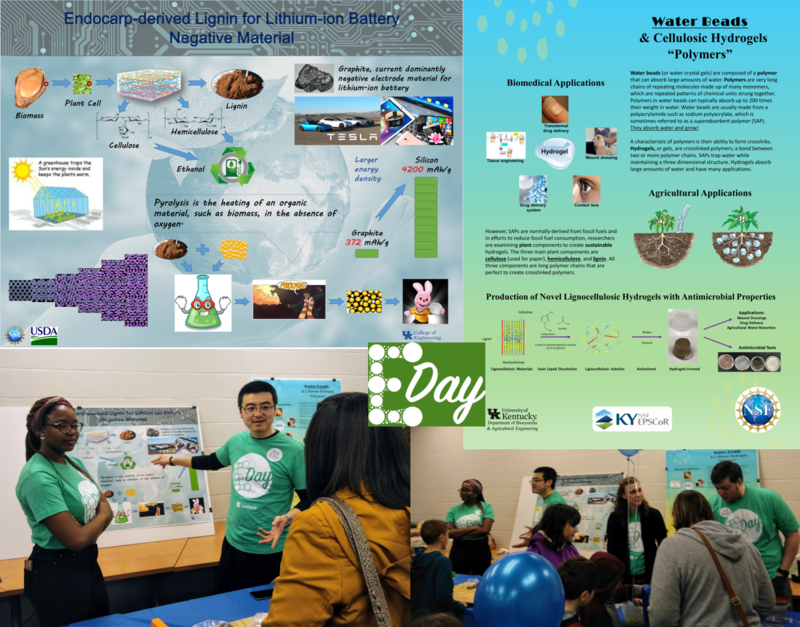 Dec 2017: Joe Stevens and Wenqi Li participated 7th Annual Sustainability Forum at UKY. Nov 2017: Members from Shi Lab presented talks at the 2017 AIChE Annual Meeting at Minneapolis, MN. Nov 2017: Members from Shi Lab presented an invited talk on IL-based lignin biocatalysis at the 2017 American Chemical Society Southeastern Regional Meeting at Charlotte, NC. Sept 2017: Makua Vin-Nnajiofor received a KY NSF EPSCoR Research Scholars Program (RSP) Award to investigate new ways to produce high-value carotenoids from biorefinery waste streams. Aug 2017: Members from Shi Lab attended the 2017 KY-LSU EPSCoR Track II First Annual Joint Conference and toured Buffalo Trace Distillery at Frankfort, KY.
Jan 2017: Read a recent blog entry "Finding a sustainable way to produce fuels and chemicals from plants" featuring Enshi Liu's research experiences as a graduate student at BAE department. July 2016: Sandra Lee joined as visiting students from Indonesia International Institute for Life Sciences. July 2016: Xiao Chen and Siquan Xu joined as visiting students from Nanjing Forestry University and Henan Agricultural University. March 2016: Areej Saeed joined as undergraduate intern. She will work on hemp based biofuels.